Thread: Confused about resistor labels. Ok... I know Ohms law, but it doesn't help me when shopping for resistors. If a resistor is labeled in Watts, does that mean the load is whatever wattage regardless of voltage? I never was that good at these kinds of questions, but I'll attempt to answer. Resistor wattage is chosen based on how much power it'll be asked to dissipate, which depends on the voltage and current through the circuit. There are equations to determine all this, but I can never remember them. Nope. no, not at all. Ok... So a 120W reisistor is going to dissipate 120W of heat? So this would put a 10A load on a 12V rail? A 120W resistor is capable of sustaining a continuous 120W load through it's body. Meaning that you hook up the 120W resistor to power and and a 10A load (@ 12V) and the resistor will work fine but up the voltage above that rating and you'll burn up the resistor. Now I'm fuzzy if it's total wattage for the circuit (120W for the load & the resistor) or for the load on the resistor but that's what the wattage refers to. Oh.. shoot. Well then that doesn't help. I was hoping to help someone build their own load tester. I never claimed to be smart, but I'm pretty good at regurgitating information. That's why I wanted to use lights, you just sample the ohm load of the bulb and multiply it by the voltage and viola, you have the wattage load per bulb. I did that originally, though and because a bulb can burn with anything from 5 to 12V, just at different brightness, it was very difficult to gage an actual load in amps. Yes, 1.2 ohm but it better be rated for more than 120W for long life. Bottom of the page http://www.bgmicro.com/search1.asp?p...ri=RES&stype=2 10 ohms @ 25W but only rated at 5%. Several in parallel might do a trick. I bought a few of the 2 ohm @ 25W for loading the 5V rail by 2.5A. 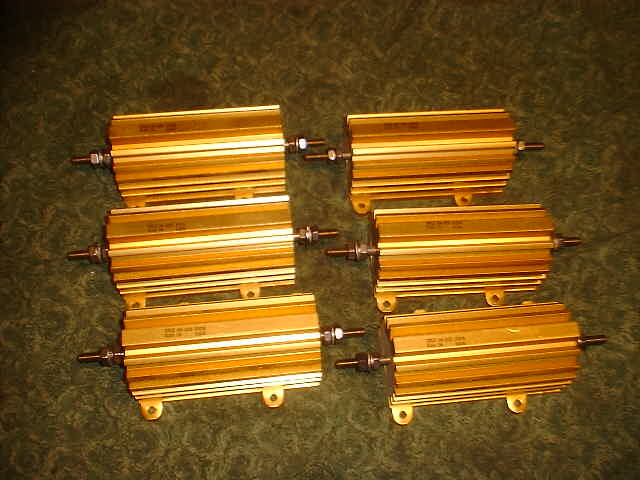 Dale resistors, 250W@5.6ohm and rated at 1% with nice looking sinks. http://www.youngssurplus.com/Dscf9780.jpg I thought about buying six of these for the $15 to make a load tester but passed on the idea. They do have a good selection of wire wound ballasts too. Light? Yes, they should work well but I'd lean toward the $0.49 ballasts at BG Micro. I did mail Super Nade a few. They seem to be of decent quality. For a load tester they would/should have a fan on'em. The burn intensity doesn't tell the load in amps, just check the ohm load of the completed circuit. A .1 ohm load at 5V is 50A so those bulbs present a 50A load regardless of the intensity of the light output. Now as the filaments heat up the ohms resistance will increase but you can guage this by putting a single bulb on a DMM in the amps setting and measuring the load of one bulb and how it decreases with time and adjusting for the change with a bank of bulbs by multiplying the number of bulbs versus the drop of a single bulb. I think power draw is more appropriate as a rating as the resistance of a material changes with temperature. P=VxI or I^2 x R.
What would you define as a load, is it power, current or resistance? Once you settle with a parameter (preferably not temperature dependent), you have the answer.